Preventative dentistry relies on good oral hygiene and regular dental care and is important throughout your life, whatever your age. By practicing good oral hygiene at home and visiting the doctor regularly, you will help prevent dental problems and save time and money. In the process, you can save your teeth and gums. By fighting plaque you can keep your teeth for a lifetime. Today, in fact, older adults are keeping their natural teeth longer because of scientific developments and an emphasis on preventative dentistry. Good oral hygiene requires an understanding of plaque. Plaque is a sticky, colorless layer of bacteria. When you eat carbohydrates (foods made of sugar or starch) you feed this plaque, which in turn produces acids that attack tooth enamel, cause cavities, and develop a hard substance called calculus (tartar). Uninterrupted, the acid attacks can result in tooth decay and gum disease (also known as periodontal disease). If left untreated, gum disease can cause loss of teeth and bone. Brush your teeth twice a day with a soft-bristled toothbrush and fluoride toothpaste to remove food particles and plaque from the tooth surfaces. While you're at it, brush the top surface of your tongue to eliminate bad breath and bacteria buildup. Clean between your teeth daily with floss or an interdental cleaner. Decay-causing bacteria can linger between teeth where toothbrush bristles can't reach. 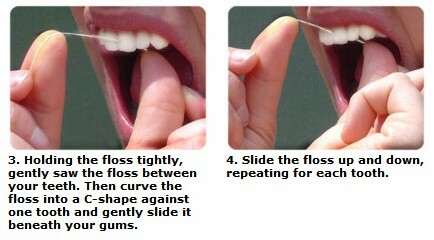 Flossing removes plaque and food particles from between the teeth and under the gum line. Eat a balanced diet and limit between-meal snacks. If a snack is needed, nutritious foods such as raw vegetables, plain yogurt, cheese or a piece of fruit should be chosen. Schedule regular check-ups. Visit the doctor regularly (every six months) for professional cleanings and oral exams. Ask the doctor about dental sealants, a protective plastic coating that can be applied to the chewing surfaces of the back teeth where decay often starts. Wear mouth protection such as a mouthguard when you play contact sports or extreme sports. Tooth decay (cavity or caries) can develop on any surface of any tooth. Because cavities grow, they are much easier and less expensive to treat when they are small. A decaying tooth may not hurt, so you may have a cavity and not realize it. The dentist checks for tooth decay at your regular check-ups and will periodically use x-rays to check for decay between teeth. The dentist treats tooth decay by cleaning out the cavity and placing a restoration (filling) in the tooth. By following the strategies listed above, you can prevent tooth decay. Gum disease (also called periodontal disease) is an infection of the tissues that support your teeth. It is a major cause of tooth loss in adults. Because gum disease is usually painless, you may not know you have it. At each regular checkup the dentist will measure the depth of the shallow v-shaped crevice (called a sulcus) between your tooth and gums to identify whether you have gum disease. Gum disease is caused by plaque, a sticky film of bacteria that constantly forms on the teeth. These bacteria create toxins that can damage the gums. Periodontal diseases attack just below the gum line in the sulcus, where they cause the attachment of the tooth and its supporting tissues to break down. As the tissues are damaged, the sulcus develops into a pocket; generally, the more severe the disease, the greater the depth of the pocket. Periodontal diseases are classified according to the severity of the disease. The two major stages are gingivitis and periodontitis. In the early stage of gum disease, called gingivitis, the gums become red, swollen and bleed easily. At this stage, the disease is still reversible and can usually be eliminated by daily brushing and flossing. In the more advanced stages of gum disease, called periodontitis, the gums and bone that support the teeth become seriously damaged. The teeth can become loose, fall out, or have to be removed by a dentist. It is possible to have periodontal disease and have no warning signs. That is one reason why regular dental checkups and periodontal examinations are very important. Treatment methods depend on the type of disease and how far the condition has progressed. Good oral hygiene at home is essential to keep periodontal disease from becoming more serious or recurring. You don't have to lose teeth to periodontal disease. Brush, clean between your teeth, eat a balanced diet, and schedule regular dental visits for a lifetime of healthy smiles. Normal, healthy gums: Healthy gums and bone anchor teeth firmly in place. Gingivitis: Gums are red, swollen and bleed easily. Periodontitis: Unremoved plaque hardens into calculus (tartar). As plaque and calculus continue to build up, the gums begin to recede (pull away) from the teeth, and pockets form between the teeth and gums. Advanced periodontitis: The gums recede farther, destroying more bone and the periodontal ligament. Teeth — even healthy teeth — may become loose and need to be extracted. The good news is that you can help prevent gum disease by taking good care of your teeth every day and having regular dental checkups. You should replace your toothbrush every three or four months — or sooner if the bristles become frayed. A worn toothbrush will not do a good job of cleaning your teeth. Children's toothbrushes often need replacing more frequently than adults because they can wear out sooner. 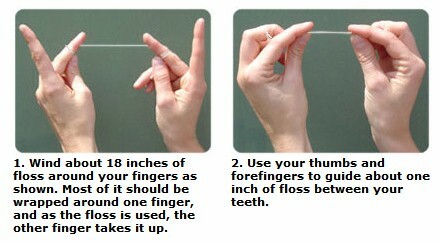 People who have difficulty handling dental floss may prefer to use another kind of interdental cleaner. These aids include special brushes, picks, and sticks. If you use interdental cleaners, ask the doctor about how to use them properly to avoid injuring your gums. When choosing any dental product, look for the American Dental Association Seal of Acceptance, an important symbol of a dental product's safety and effectiveness. Talk to the doctor about what types of oral care products will be most effective for you. The ADA Seal on a product is your assurance that it has met ADA criteria for safety and effectiveness. Look for the ADA Seal on fluoride toothpaste, toothbrushes, floss, interdental cleaners, oral irrigators, and mouth rinse. By taking care of your teeth, eating a balanced diet, and visiting the doctor regularly, you can have healthy teeth and an attractive smile throughout your entire life.